Check-in for flynas is located in Zone D of Terminal 5 at Riyadh – this is just 1 of 2 airlines operating from this terminal and it is easy to find the well branded check-in desks. Flynas operates a communal check-in service and customers can check-in at any of the open desks. For this flight there was a short queue but the entire process was completed in less than 5-minutes. The service can only be described as efficient – there is no dialogue other than to confirm the destination and the number of checked bags. Considering how quiet it was, it would not have been much more effort for the staff to offer some additional information regarding boarding time, gate location and directions to security. Whilst flynas is a low cost airline, there is no check on hand baggage weight or size. Boarding begins well in advance of departure and is completed on time. Having said this, there is no zonal approach or pre-boarding options and as such there are some long queues both at the gate and in the airbridge. Onboard the welcome at the aircraft door is friendly and the International cabin staff are proactive in the cabin with hand luggage placement on this busy flight. 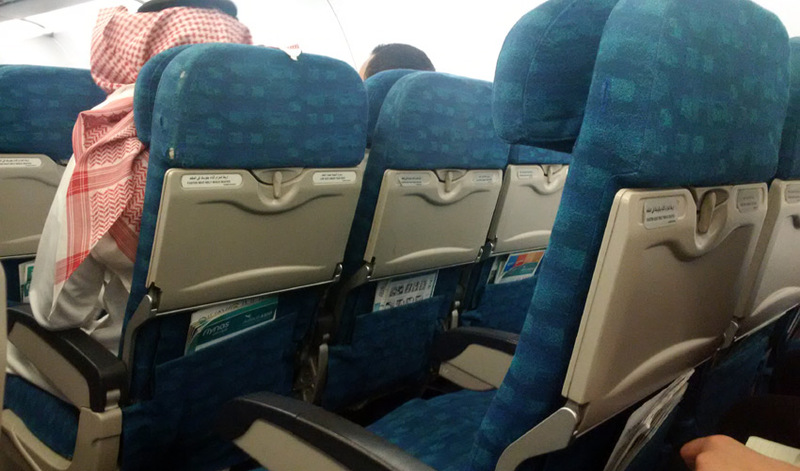 Airbus A320 in Economy Class was at near capacity with just a few spare seats. 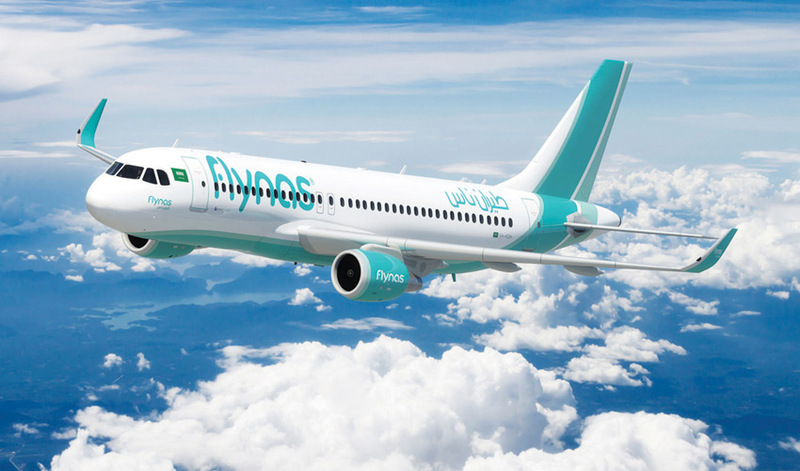 In contrast to many low-cost airlines, flynas give a 20kg baggage allowance in their lowest ticket category. An item of hand luggage is permitted and as discussed this is not weighed or checked at any point from check-in to boarding. This Economy Class seat space feels adequate for this short domestic flight. There is an adjustable headrest and the seats do recline. 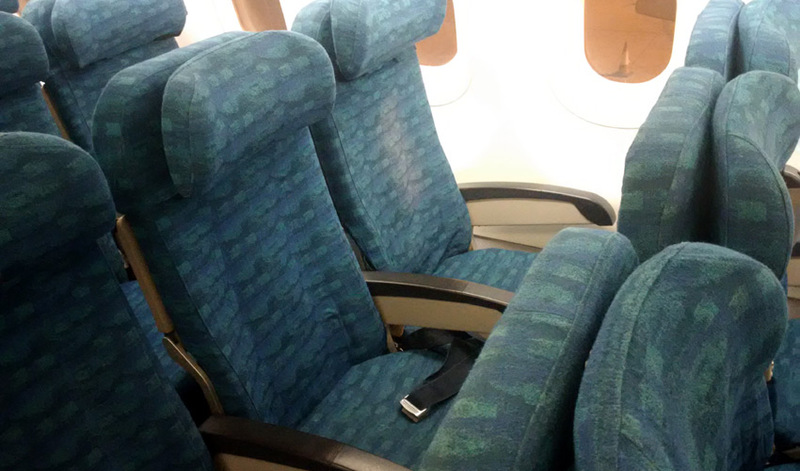 The green seat covers fit in well with the wider flynas brand and the overall condition is quite satisfactory. Like many low-cost airlines there is no USB or other power outlet available. The cabin is clean on boarding and the carpets and seat covers well presented – the overall condition of the aircraft is satisfactory although the tray table at this seat is slightly unstable and does not sit straight. There are 2 standard washrooms at the rear of the cabin and even on this short flight they are not particularly clean shortly after departure. The flight pushed back 10-minutes after schedule and took-off 30-minutes late in total. We arrived into Dammam just less than 10-minutes late. Onboard food and beverage sales begin promptly after take-off with 2 carts. The first cart delivers pre-ordered meals and the second offers a range of items for sale and these are reasonably priced. 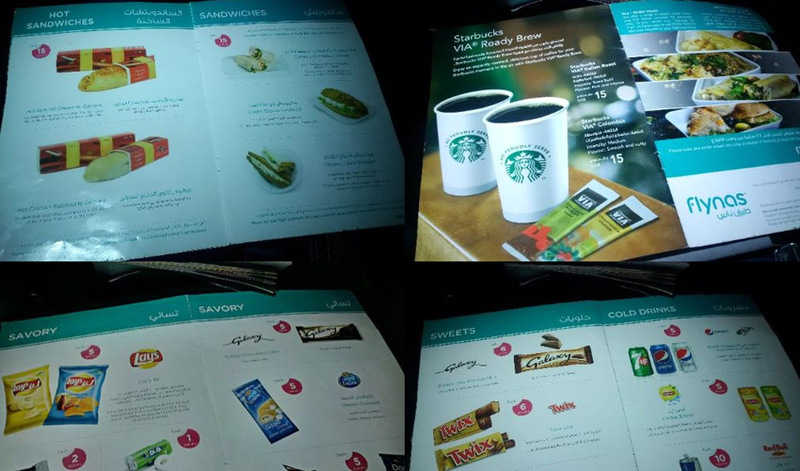 The onboard menu offers a range of local and International flavours including hot and cold sandwiches, cup noodles, potato chips and confectionary. Beverages include the usual soft drinks, water, juice and a range of hot drinks from brands such as Twining’s and Starbucks – although on this short flight hot beverages are not available. Prices are average on a global basis with most items costing less than 15 Saudi Riyals (approx. USD4). Payment is in cash only in Saudi Riyals and a range of International currencies. There is no personal inflight entertainment on this short domestic flight, however, there is an interesting inflight magazine. This contains a range of articles on domestic Saudi subjects as well as some International features. There is also various airline route and product information. The cabin crew is International with staff from Asia, Europe and the Middle East and they work efficiently during boarding and managed to complete the food and beverage service quickly on this short flight. There is no time for pleasantries but staff are polite during interactions and that is all one can expect. Announcements are clear and informative and flight deck communication is also good regarding flight details and delay information. Overall, a satisfactory low-cost airline experience – the airport service in Riyadh could have been a bit more personable and organised, but the onboard service was pleasant and efficient. The food and beverage options cater well for local and International customers – although make sure you have cash for purchases.